The FA system is very flexible in the way it can handle sales, from complete integration with a manufacturing process to just issuing invoices. You can use the complete sales process or just the steps you require depending on your operation. The menu options below are annotated with suggestions as to which Department would use them. Sales Invoice is sent for products. Sales Invoice is paid by Customer. Customer is returning Items to us for some reason and the items are ok.
Credit Note is sent to Customer. Bank Payment is sent to Customer as Compensation for returned Items. Go into Allocations, because the Credit Note has taken over the former allocation and the original Payment is left with no allocation. Use this original Payment for allocating your Bank Payment to the Customer and everything is correct. Alternatively, instead of doing the no. 5 above - Bank Payment to pay the customer as compensation - you can make an agreement with the customer to let the Customer Payment be there waiting for allocation of a future Sales Invoice. Use a pre-selected template for delivery. 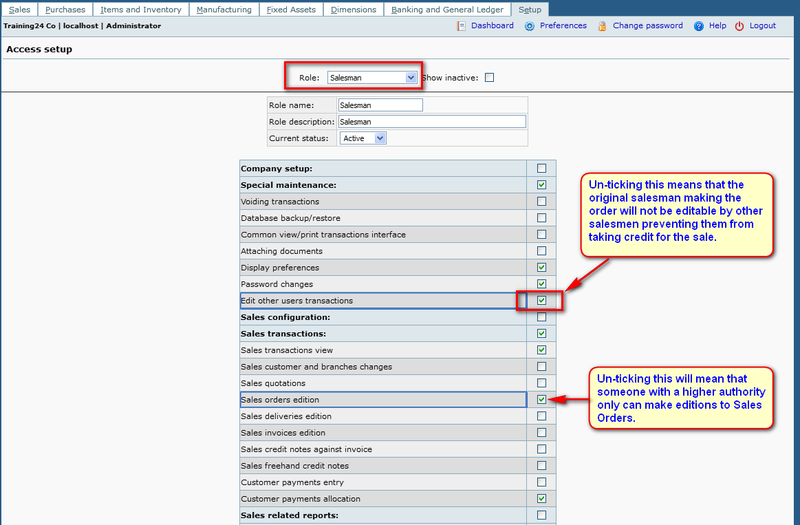 Use a pre-selected template for invoicing. Delivery and Sales Order in one step. 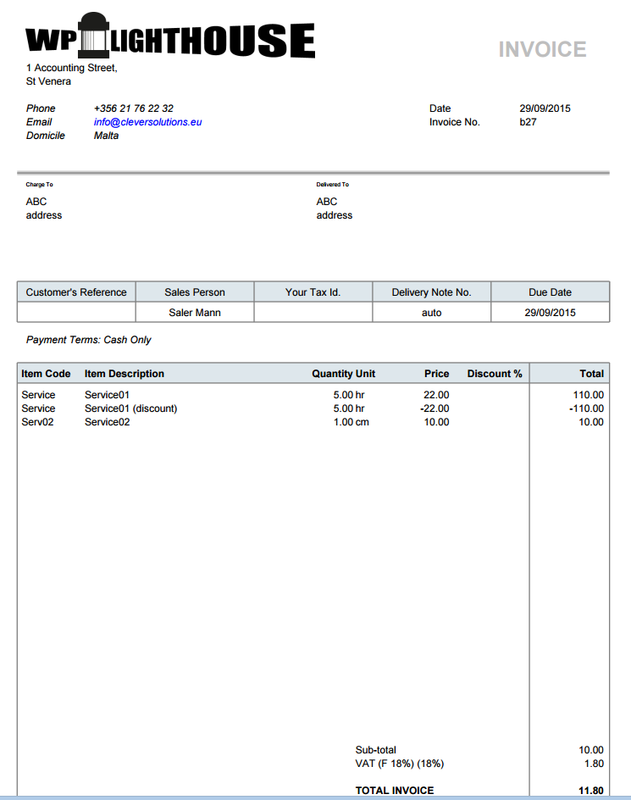 Create due Recurrent Invoice and print/email them. Sales Invoice, Delivery and Sales Order in one step. Customer Payment and optional Allocation. Select Sales Order and dispatch goods. Search outstanding Sales Orders. 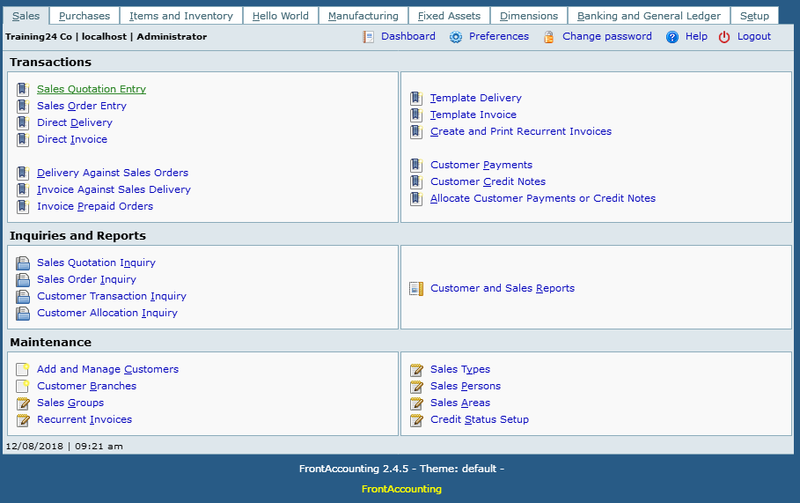 Configure Invoices to be sent on a regular basis. Search by Customer Reference to make payment: The Customer Order Reference field when you create sales order can be amended with your customers order number, so 008/2018 could become 008/2018 ON-5678330 and to confirm this is the value that will appear in the Reference' column of the transaction inquiry/allocation inquiry page. 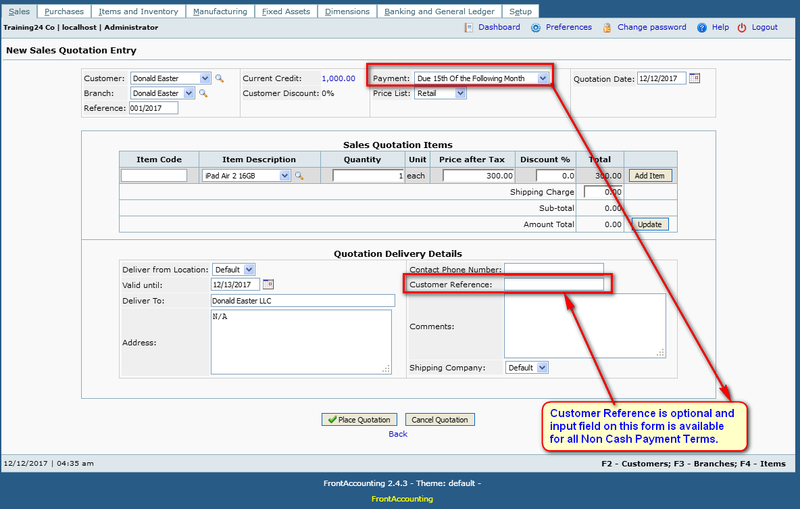 When printing Invoices from print-out center, you can select to include a Paypal link. If you want to be paid by credit card, then create a bank account with the name of the credit card. Before invoicing service type items to customers, the service items must be explicitly added to the list of items as such. Legal Text is available only in Invoice and not in Order Entry form. Forum Post: The Customer Reference is available as an option for input in all Sales Forms (Sales Quotation, Order, Delivery and Invoice) where the Payment Terms (mandatory) is "Non Cash". Screenshot. Scenario: Customer just walks in, buys the items by paying the cash. Setup => Payment Terms => create new payment terms as Cash type but name it Credit Card. Create a GL Account similar to Petty Cash account_code and call it Credit Card (CC). Create a bank account for Credit Cards and assign the Credit Card GL Account to it - this is your merchant bank account. Create a POS for Credit Cards in Setup => Points of Sale and assign it the bank account for Credit Cards with atleast Cash sales enabled. Create a new user with appropriate credentials and assign the POS for Credit Cards to it. Now this new user can create credit card payment invoices that would go to the Credit Card Cash Account. Prepayment terms are not available in Direct Invoice form. If they are on your setup, you have badly defined prepayment terms. 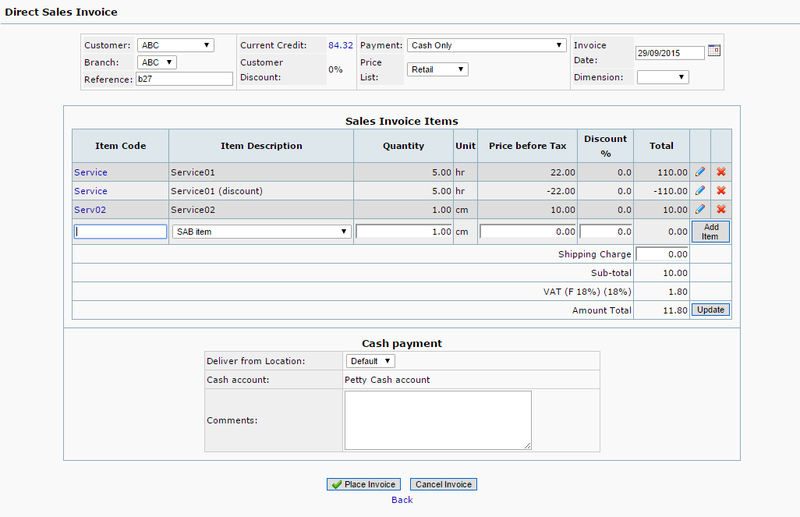 Finally issue invoice against the payment in Invoice Prepaid Orders screen. Prepayment invoices are maintained in this special procedure, as what is invoiced here exactly, is payment received, not the goods sold. Prepaid Sales and Purchases are now available in FA 2.4.x but use with care - Forum Post. Choose this Deferred Income Account in the Banking and GL Setup page under the same head. Now we can make a Sales Order with the Payment Terms as Prepayment, accept payments for it and then invoice the Prepaid Order. As of Dec 2017, none of the official Charts of Accounts including the Standard ones have a Prepaid Type Payment Term and Deferred Income Account by default. Deferred revenue is not yet revenue. It is an amount that was received by a company in advance of earning it. The amount unearned (and therefore deferred) as of the date of the financial statements should be reported as a liability. The title of the liability account might be Unearned Revenues or Deferred Revenues. doctext.inc has the label for the Item Code field that can be replaced with a blank string. The appropriate report (like rep107.php) can be edited for where the Item Code line prints and can be placed in the appropriate company/#/reporting folder. When we choose to offer an Service item (does not affect inventory) for free but would like to see the unit rate and qty in the printed invoice we need to enter the discount as a separate line item with negative rate to indicate the discount.